"Can you imagine how fine a drink the black ichor that collects in leaden coffins can be?" As far books go, this one was a gem. I've had my eye on it since this time last year, when many bloggers were reading it for RIP. Then I received it as a birthday gift from my generous friend Ben and couldn't wait to read it. The Graveyard Book sucked me in immediately; set in a delightfully macabre atmosphere we follow Nobody Owens, Bod for short, a human boy raised by ghosts in a graveyard. Bod is taught all of the things that the dead know and learns how to move around the graveyard just as a ghost does. He is granted freedom of the graveyard, visits the world of the ghouls, and befriends a dead witch who lives on unconsecrated ground. The story is a coming of age novel related in a unique and compelling way. Though the book incorporates the fantastical; ghouls and ghosts, mist walkers and high hunters, it also works didactically, highlighting the importance of seeing the world and living a fulfilled life. All in all, it turned out to be a really fun read, especially for this time of year. It was straightforward without feeling simple; fanciful without feeling contrived. In Gaiman's acknowledgments that follow the novel, I found a particularly interesting tidbit: "Artist and author Audrey Niffenegger is also a graveyard guide, and she showed me around the ivy-colored marvel that is Highgate Cemetery West. A lot of what she told me crept into Chapters Seven and Eight." If you have read Her Fearful Symmetry, you know how vast and intriguing Niffenegger's descriptions of cemeteries can be. Even though the two novels are very different, I couldn't help but smile after learning each were influenced by the famed Highgate Cemetery. I think the descriptions of Highgate Cemetery were my favorite bits in Her Fearful Symmetry. The plot itself disappointed me. I'm glad you loved this one though. It's wonderful! I really liked this book as well (my thoughts: http://manoflabook.com/wp/?p=1550). I really liked the whole sanc­tu­ary premise of it. Cannot believe I haven't read this one yet! Sounds delightful and yes, perfect for this time of year! Great Book. I read it earlier this year. I'm planning on reading American Gods before the end of the year. Thanks for this review. I've picked up The Graveyard Book off the shelves the last few times I was in the bookstore, but then put it back at the last minute. I think I'll have to get it next time. This was a gem, wasn't it? I loved the underworld scenes and wish there were more of them! Those little ghosties cracked me up. Child raised by ghosts? 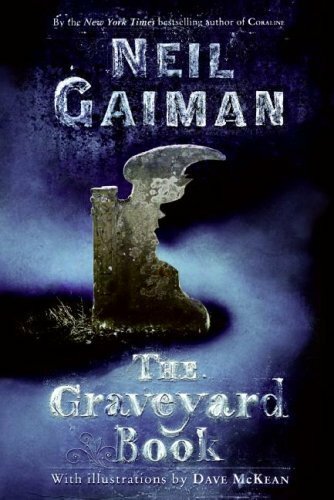 This sounds awesome...reading Fragile Things has me dying to try one of Gaiman's longer works, this might be the one to start with. This was such a great book ... I love how Neil Gaiman can write so effortlessly adult AND children books. It's nice that the children's books can be read by adults, too ... Coraline is another great one! And The Wolves In The Walls.